My recent trip to Target ended up being pretty productive… I ended up walking out with a ton of new summer candles and one I couldn’t wait to try…. Tomato Flower & Herbs from Herb’s & Irma, a new brand to me I recently discovered at Target. Cute candle. 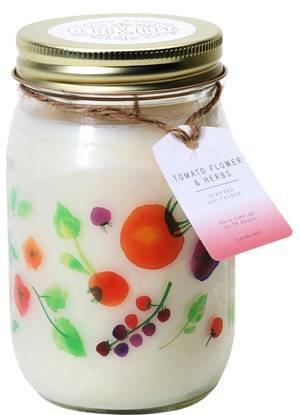 The style was a standard mason jar with a clear label with fruits, flowers and veggie covering the label. The scent itself smelled fresh and fruity with hints of floral. It was different and I really liked it based off cold sniff. I couldn’t find a scent description for this fragrance which was a bummer. All I can tell you is it definitely had floral notes to it but it also was very fruity and fresh. Looking at the listing online at Target, this scent is listed as “herb” but it didn’t smell herbal at all. I guess the true test will be the aroma once burning. I lit this candle in a small bathroom to start out where it stayed till the very end. Once the wick was lit, it took a good hour to reach a full melt pool and from then on out, a fresh kind of veggie/green/floral scent filled my bathroom. It wasn’t too fruity and it wasn’t too floral but a perfect balance of the two. I don’t know… maybe the Tomato Flower was the fresh component I was detecting. Whatever it was, it was really clean and fresh… a perfect scent to brighten up any small room. Strength – this scent was on the lighter side. On a scale of 1 to 10, I would rate this candle a 5 in a small room. Because of that, I wouldn’t even attempt anything larger. This candle burned great. No wick issues. Clean burn from start to finish. Tomato Flower & Herbs from Herb’s & Irma was a pretty enjoyable fragrance and a scent I would describe as a super fresh and clean floral scent. I really liked it, I just wish it would have been a tad stronger so I could have burned it in a larger room. One thing is for certain… I will purchase this candle again. I really loved it. Check out this fragrance next time you’re at Target. It’s available in a few different styles and sizes so maybe next time I’ll try a bigger size.